Part 2 in a series of adventures seeking US coins in places where they are foreign. Part two in a continuing series of adventures. Disguised as a data exchange specialist, mild-mannered Mike Strub is dispatched to various parts of the world by his employer to develop computer data standards; but in his time off while abroad his true numismatic motivations become manifest; he has come on a mission. A mission characterized by a restless and relentless search for numismatic acquisitions; A mission he calls COINING. Another trip! I had begun to think of the trip to France last year as a one-time trip which surely wouldn't be repeated, when I was told I would be traveling to South Korea on a similar kind of business. Having never been to that part of the world, I began, in my spare time, to look into what numismatic opportunities might be available there. Learning Korean? While I had expected to be able to learn a little French before traveling to France, and had even been successful at it, I didn't hold out much hope of learning Korean. Few languages could be so very different from what I knew. However, there were several good sites that taught pronunciation of key phrases, so I tried them, and found I could remember a few. But I didn't even attempt to figure out the Korean alphabet, Hangul. I would be at the mercy of the English skills of the good merchants and citizens of South Korea. Korean facts I did learn some very interesting things about Korea. I learned that Seoul means "capital" in Korean; that Korea is a confluence of Chinese, Indian, and Japanese cultures; about the devastating civil war that killed 3 million North and 1 million South Koreans, in addition to over 50,000 Americans, a war that is technically not over. The alphabet, invented by scholars in 1446 at the direction of King Sejong, is a marvel of scientific design which uses letters that symbolically depict sounds as diagrams of the shape of the mouth, tongue, and/or throat required to make them. The most intriguing thing I learned was that the Korean language is part of a language family that includes Hungarian and Finnish - indicating some kind of shared origin of these very distant and different peoples! Where are the dealers? Next I searched the internet for references combining "coins, coin shops, or numismatics" and "Seoul, Korea, or South Korea." I found only one. A vague reference to an arcade of under-ground shops near a certain market in Seoul, the city where I would be staying. That was all. Now, I am not really a collector of Korean coins, and didn't plan to become one. I was hoping mainly to encounter coins from countries I do collect, such as Thailand or the Philippines. But now it looked as though it would probably be difficult to find any coin dealers at all. Travel despite terror When the time for the trip had come, we very nearly had to cancel. The terrorist attack on New York had inspired my employer to cancel most international trips. But I found a loophole that enabled me to proceed, and there were no hitches in the trip whatsoever. Korean Money Upon arrival, I noted that our hotel only used crisp new bills and shiny new coins dated 2001. I was able to accumulate a nice little group of beautiful current coins from them. The Koreans have surprisingly few coins and bills in circulation. Although the Koreans have a decimal coinage system, the South Korean Won is worth too little to be subdivided; 10 won, the denomination of the smallest circulating coin, was worth about eight tenths of a cent. 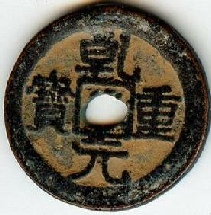 50 won and 100 won coins also circulate, but the 500 won coin was fairly uncommon. The bill denominations were only 1000, 5000, and 10,000 won - nothing higher! I surmised that there is simply little need for hard cash - larger transactions are probably carried out by credit cards and such. Still, I wondered about large interpersonal transactions requiring huge stacks of those 10,000 Won notes, since each was only worth about eight U.S. dollars! Take me to your numismatists I now had some nice numismatic souvenirs - modern circulating coinage in BU. But what of that coin shop arcade I had heard about on the internet? The hotel concierge was not much help. He had never heard of this underground arcade. But the internet source had mentioned that the arcade was near one of the big open-air markets in Seoul - near the city's ancient South gate, and named after it: Namdaemun market. I took a subway there and began walking around and through it. None of the vendors appeared to have collectible coins, or anything like them. I was afraid to start asking these strangers where a coin shop could be found; I thought it might be unwise to advertise that I was a coin collector. Eventually, though, I grew desperate, and started asking where I could find "old money". The very friendly vendors wanted very much to help me, but they thought I was asking where to change my money into Won, or that I wanted to make change. Finally, I saw a light bulb appear in the air over a gentleman, who assured me he was NOT trying to take me to a money changer. He motioned for me to follow him, as he headed out at a very brisk pace. We darted in and out of alleys, past dozens of vendors' stalls. Then we were at the edge of the market, turning down a main street and into a stairway leading down to the subway. We walked down, made our way through several turns in the subway labyrinth, and I found myself being introduced to a coin and stamp dealer! I turned to offer a tip to the kind man who had led me here, but he bowed and refused. I thanked him, and he turned and went. This was the jackpot! In all, I counted 13 coin and/or stamp shops! Success at last! The shops came in two sizes - small and tiny. As I looked through their merchandise, I was reminded of the foreign-coin junk boxes one sees in American coin shops. Except, that every coin is common, modern, of low denomination, and basically uninteresting. In shop after shop I found nothing of interest, and high prices were being asked even for these. In one shop, however, the gentleman had a few better coins, and I walked out with a handful of interesting Korean commemoratives, a few modern Thai coins I needed for my type collection, plus a beautiful VF cash coin from 1757 (yes, this one can be traced to a single year!) which I selected for a friend back home. What a deal! Not all of the shop vendors were friendly. One vendor claimed to have an American gold piece. I asked to see it, and was shown a cull common date with deep scrapes. Without my asking, he told me the coin was worth 300 million won. Not having 30,000 of their highest denomination bills handy, I took a pass on this bargain. It was clear that he and many of the other vendors were not really numismatists; they treated coins as curios - something that could be bought in bulk, then sold to tourists as "valuable treasures" - one at a time. Another vendor became offended when I tried to bargain with her. I was not allowed to look at any additional coins, which was her way of telling me to "get out." The final shop I visited was run by a very kind and friendly lady. Largely due to her attitude, I purchased a 2001 Korean mint set - which featured not only the circulating denominations I have mentioned, but also a 1 and 5 won coin only found in these sets. 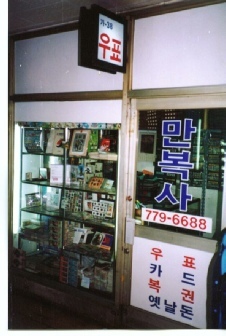 A photo of her tiny shop - approximately six feet by six feet - accompanies this article. How about North Korea? It would have been exciting to be able to go to North Korea. But there was no chance of that. First of all, to get into North Korea, you cannot be an American. That ruled me out. Except that there is a village lying on the very border between North and South Korea: the "truce village" of Padmunjom. However, the high international tensions resulting from the terrorist attack on our country had caused a cessation of tourist visits there. Had I been able to go, all I could claim afterward is that I had walked around a table in a room on the exact border; and that while on one side of the table, I had technically been in North Korea. Despite knowing this in advance, I did take the "DMZ tour" which takes you into the 4-kilometer-wide De-militarized zone between the two Koreas. This included a tunnel, dug by North Koreans under South Korean territory, which was discovered by the latter in the early 1970's. Tourists can actually descend over a thousand feet down a steep walkway in an interception tunnel dug by the South to reach the North's tunnel. After reaching the bottom, you can walk several hundred feet before hitting the first of three concrete and barbed-wire tunnel barriers which the South erected. Korean Numismatics (as I see it…) South Korea isn't exactly a numismatic Mecca. If there is much of a collecting community, it is probably small. Perhaps this is because modern Korean coinage restarted in 1959 after a gap of 5 decades - the last silver and gold coins minted for Korea bear the equivalent of 1909 dates. Young and middle-aged people have never known a time when valuable coins could be found in circulation. Older people were hardly concerned with collecting coins while their nation was in turmoil. So don't go to South Korea for the numismatics; go to meet the good people there. They are among the world's friendliest, kindest, and most beautiful.